The Bangladesh government has cut a deal with India to build a 1320 Megawatt coal plant in the Sundarbans forest and is refusing to back down from it -- no matter the cost to the people nearby, or the country's climate future. The Rampal coal plant would require transporting millions of tons of coal through narrow waterways, and further erode the forest's cyclone protections -- not to mention put surrounding communities at risk of toxic pollution of every kind. 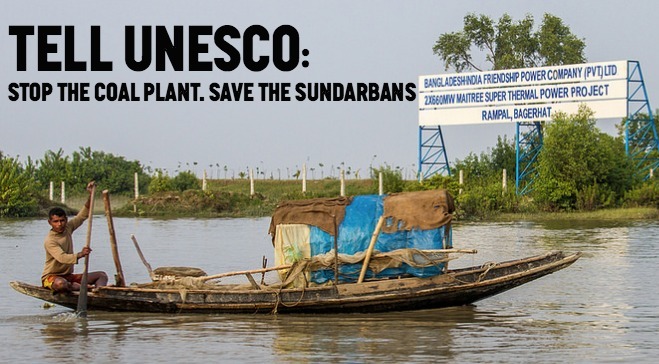 UNESCO has the power to send an international signal to the Indian and Bangladeshi governments that they cannot continue to put coal and profit above the communities that live in and around the mangrove forests by listing the Sundarbans as a World Heritage Site in Danger. New coal plants pose a clear danger to the Sundarbans forest -- a critical defense against cyclones, a source of livelihood for millions, and a protected World Heritage site. Include the Sundarbans in the list of World Heritage Sites in Danger and send a message that people must come before coal. They have the power to call out the Bangladeshi and Indian governments' recklessness on a world stage. Can you help spread this message by sharing this with your social networks?